If the colorful half-timber houses and cobblestone alleys of Rothenburg weren’t magical enough on their own, the village is also encircled by a timeless Medieval wall. As early as 1142AD, sections of the fortified stone wall were protecting the young trading center and its royal castle. After being named a Free Imperial City in 1274, the fortifications were strengthened, the watchtowers were enhanced, and the wall was expanded as the city grew. Rothenburg grew to be the 2nd largest city in Germany by 1400 thanks to the markets that prospered behind the protection of the 2-mile long city wall. While the castle is long gone, the wall, its covered ramparts walkways, and many of its towers have been well preserved for your enjoyment. This preservation is because the city never expanded and modernized due to financial hardships after the 30 Years War in the 1600s and because citizens came together after WW2 to sponsor restoration from damage caused by bombings. We hope you enjoy our Rothenburg city wall walking tour as taking even a brief stroll along it shows you a side of the beautiful village that many tourists miss. Our suggested route is a grand tour loop of everything worth seeing along Rothenburg’s city wall trail (Turmweg). If you are doing this walk in conjunction with our Old Town walking tour which ends at Plönlein Corner starting there and working your way through stops 12 to 1 in reserve order. If you are in Rothenburg for a few days, you will also want to pop out to the Old Mills Path, Panoramic Vineyard Trail, and Mayor Topper Route which are all short and marked on our map. About Saint Mark’s Tower: As you leave Market Square on the road that once led to Nurmenburg you quickly see part of the original town wall at Saint Mark’s Tower. In the late-1100s this was the outer edge of the first city wall with access through its timeless Woodsman Archway (Röderbogen). This Medieval gateway with a stubby clock tower was part of the first ring wall protecting the early village. By 1204, the first town wall had 4 watchtowers including the Red Tower (Roter Turm), White Tower (Weißer Turm), Blue Tower (Blauer Turm), and Saint Mark’s Tower (Markusturm) built here behind the archway. This intimidating tower has a lower level with walls that are 6 feet thick walls which housed a prison until 1844. Make sure to look at the roof of Saint Mark’s Tower where an elevated nest serves as a nursery for a family of storks in the Spring through Fall. As you pass through the archway, the half-timber homes lining road was stunning and create a beautiful backdrop when taking photos of the front of the gate. Maybe the best vantage point is near the flower-laden Woodman’s Well (Röderbrunnen). Because of how wide the well is, it once served as a birthing fountain (Tränkbrunnen) in Medieval times. Each Spring the Röder Well is one of the main fountains in Rothenburg that gets decorated with Easter eggs to bless the water. The hollow eggs that elaborately cover the Easter Fountains (osterbrunnen) are brightly painted and strung to form a beautiful garland. About Röder Tower: As the city wall expanded outward starting in 1208, it multiplied to include a staggering 70 watchtowers and the Woodsman Tower (Röderturm) was the most impressive. With its perfect vantage point, this is the only true observation tower on the Rothenburg town walls. Every night one of the city watchmen in the Woodsman Tower would signal back to the city center letting everyone know that either all was well or that danger was on the way. This is the only tower along the wall that you can climb to the top, and it houses a special exhibit about the tower to go along with the views. Sitting in front of the watchtower is the Woodsman Gate (Rödertor) which you need to visit before climbing the wall. As you exit the multi-stage gate, two stone bridges (formerly drawbridges) lead you over the town’s dry moat as you pass armed curtain walls, guardhouses, an elevated gatekeepers cottage, and go through three archways to reach the end. The beautiful twin huts with pointed roofs at the end were used as a toll booth and customs house starting in the 1300s. Seeing the full Woodsman Tower Gate from the outside will let you experience how formidable it was at protecting the city. 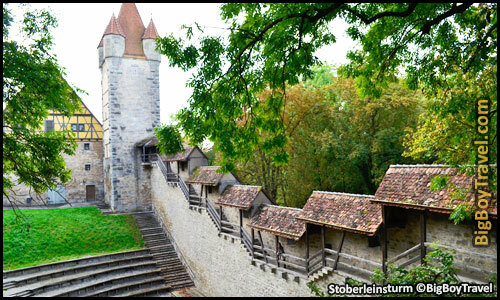 After backtracking through the gate system, you are ready to climb the stairs and start walking on Rothenburg’s wall. Observation Room Hours: Daily March-October & December 10am-5pm; weather permitting; November & January-February. Observation Room Cost: 2€ for adults; 1€ for children. Access Onto The Wall: The there is a fee for the upper observation room, walking onto the wall is always free and open 24 hours a day all year. About The Blacksmith House: Starting at the Woodsman Tower you can climb up to start walking on top of the Rothenburg city wall which quickly gives you a birdseye view of the famous Blacksmith Shop. The uniquely shaped half-timber blacksmith shop was built on a triangle corner lot in 1469. This colorful home has an excellent coat of arms made up of blacksmith tools. The shop had to be repaired from a fire during WW2 bombings, remained an active blacksmith until to was bought as a private home in 1967. It is great to admire the Blacksmith Shop from the wall’s ramparts, but if it looks like something if you want to see it up close you will want to do that before starting the wall walk. The side of the building as an interesting carriage door once used to unload goods and the facade has all sorts of rod iron decorative elements from horseshoes and a medieval shop sign to metal dragon crest. From the Woodsmantower to the next set of steps down at the Ruckesser Tower, it is a continuous 400 meter (1/4 mile) walk with no steps to get down in the middle by the shop. About The Rotten Tower Stroll: As you pass the Blacksmith’s house, the next stretch of Rothenburg’s city wall is the most popular for tourists to walk along. The views of the village’s skyline from the wall are excellent and you get to stroll below the Rotten Tower. The Rotten Tower was built in from 1385-1400 to house serious criminals as is one of the only round city wall towers in Rothenburg. Make sure to also take a look at all of the stone plaques inside the wall with family names on them. During WW2 Allied planes dropped bombs on the North side of Rothenburg, killing 37 people, destroying 306 houses, 6 public buildings, 9 watchtowers, and damaging over 2000 feet of the wall. Luckily trough generous donations the damage was able to be restored close to its original state. Many of the donations came from people sponsoring 1 meter long sections of wall by buying plaques with their family names on them. When is started in 1950, each sponsorship cost $40 per meter and are now over $2000 a meter. As you walk the wall make note of the various plaques from sponsors by local and foreign. About Sifter Makers’ Tower: Walking downhill from the city wall, you will come to the Sifter Maker’s Tower (Siebersturm) which was added in 1385 as part of the new fortifications. The tower was originally called the Inner Gebsattler Tower when it was adding above the archway, but was later renamed for the Association of Flour Sifter (Sieve) Makers. The view standing on the Southside of the tower and framing up old town Rothenburg to the North inside the tower’s archway is one of the most magical in Rothenburg. If you look up at the coat of arms shields on the tower, the red twin tower castles are the symbol of Rothenburg while the black eagle with a yellow background was the crest for the Holy Roman Empire in 1274 when the town was elevated to a Free Imperial City. Some people are confused by the icon as the Empire later switched to a double-headed eagle holding a shield. Along the South side of the tower is the Landwehr-Bräu Tavern (website) housed inside a beautiful yellow medieval house. This small restaurant is known for having great beer and very affordable food as it caters a little more toward locals with its later hours. As part of the decor inside they have a really cool clock with a miniature version of the Master Draught from the facade of Rothenburg’s Council Drinking Hall. Restaurant Hours: Tuesday-Friday 5pm-midnight; Saturday 3pm-1am; Sunday 3-11pm; Closed Mondays. About Infirmary Quarter: While originally centered on the Parish of Detwang on the Tauber River, in 1080 the village of Rothenburg started to move up the hill. One of the first buildings up the hill was a small fortress for the Counts of Komburg on the so-called “Vinegar Jug” near the Infirmary. When the first city walls were built in the early-1200s, the neighborhood was left outside of the walls. In 1280, a religious order called the Knights of the Hinterland established a hospital to help the sick and poor called the Holy Ghost Infirmary. The Infirmary was eventually enclosed by the city wall in 1370, but a large fire in the 1500s required most of the hospital complex except the Holy Ghost Church be rebuilt. About Hegereiter House: Built in 1591, this funky looking building is the former Infirmary hospital kitchen and the uniquely shaped wooden roof follows the curves of the original tent roof. While the lower level was the kitchen, the loft area of the Hegereiter House doubled as the home of the manager who was in charge of multiple Infirmary properties. Like the Spital Bastion, this house was built by local master builder and famous stonemason Leonard Weidmann. About Stöberleinsturm: This gorgeous watchtower is the only ones in Rothenburg with its original Medieval roof and has corner turrets which most of the other towers also had. Built outside the city walls, the tower and connected building served as a hospital and center for the poor. The section of multilevel wall behind the theater bowl is our favorite section to walk in the city. Outside of Rothenburg’s city wall near this tower once was the Vinegar Jug Castle (Burgstall Essigkrug) which was built by the Counts of Comburg around 1080. The Counts oversaw this part of Franconia including the nearby parish in Detwang as early as 970 from their court in Schwäbisch Hall. While their fort was half the size of the Hohenstaufen Castle built nearby in 1142, it was an important vantage point for protecting the Tauber River below. By 1115, Conrad III Hohenstaufen (whose uncle was the Holy Roman Emperor) who married the daughter of the last Count of Comburg-Rothenburg just a year before the line died out. Conrad would then go on to become the Duke of Franconia in 1116, the King of Germany in 1138, and built his own larger castle in Rothenburg in 1142, which help establish the town by 1170. We will visit the ruins of Conrad III’s castle which was damaged by an earthquake in 1356, later on this Rothenburg City Wall walking tour. About The Horse Mill: Built in 1516 as a corn mill, the Rossmuhle was powered by 16 horses instead of with water power like other waterfront mills. The large mill is one of the best buildings in Rothenburg to photograph and we love the curved port windows in the roof. 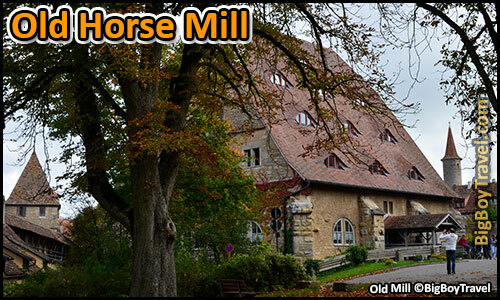 At one point it the mill was said to be the biggest in Southern Germany before time, technology, and an eventual fire caught up with it. Since being renovated in 1957, the former mill now serves as a youth hostel and is one of the most reasonably priced hotels in town. About Kobolzeller Tower: Leading up from the Tauber River Valley, the Kobolzeller Gate has numerous extra layers of protection from unwanted visitors entering Rothenburg. Following the Earthquake of 1356, the Kobolzeller Gate was expanded into a 4 gate kennel system complete with two towers. You can walk across the gate’s bailey wall to the Devil’s Pulpit in front of the tower to shoot invaders square on. The tower was named after the tiny Kobolzell settlement that once lay below Rothenburg along this stretch of the Tauber River Valley. Only the Kobolzeller Church, the Double Bridge, Lords Mill Inn, and a few residential houses remain from the settlement. If you take the steep path down to the Tauber River you can get an excellent photo back up the hill of the Kobolzeller Gate through the trees. About Plönlein Corner: Meaning Small Level Area in Latin, the postcard-perfect shot you were looking for, Plönlein Corner is the most iconic image of Rothenburg. The bright yellow half-timbered house is almost jaw-dropping. Get there before or after the tour buses roll in to get great photos with the square free of tourists. Also make sure to check out the cool flower bed made out of a former well fountain in front of the home. Plönlein means small level area,but its the change in elevation in the split of the road that makes it cool. About Panorama Trail: With wide swiping vistas of the Tauber Valley, you can see why the trail below this section of city wall has been called the Panorama Trail. There is an elegant Baroque garden directly below the viewpoint which turns into a vast vineyard stretching out all the way to the Hohenstaufen Castle ruins. If you explore this short trail during your visit to Rothenburg, you will fall in love with the playful stone statues that line the top of the vineyard. About Saint John’s Church: As the round the corner by the viewpoint, you’ll see a pair of stone fish ponds that we find to be really cool, but are often overlooked. The tanks were holding ponds to keep fresh fish on hand at the Saint John’s Monastery. The ponds once a large Mediterranean style walk-in hut before being remodeled into their low profile form in 1856. Supplying the water for the fish pond, the large Saint John’s Fountain (Johannisbrunnen) next to the church is the biggest well in town, able to hold over 25,000 gallons of water. It was built in 1608, remodeled in 1716, and is decorated with a beautiful column capped with the zodiac sign Aquarius to bless the water. Originally built in 1200 as the gothic chapel for the nearby Saint John’s Hospital, the now pink Saint John’s Church also served as the headquarters of the Order of Saint John Monks. The hospital was built just on the outside of the City Gate (Stadtturm) for the first city wall as to not spread infections in town. 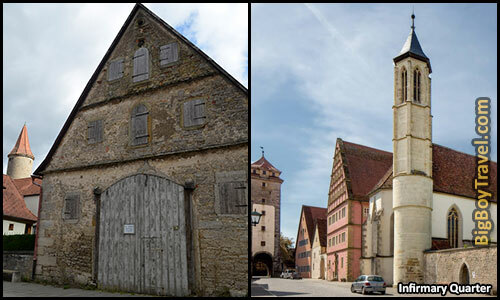 As a small suburb started to spring up on the Southern end of Rothenburg, the city wall was expanded in 1385. This expansion also gave the church space to be totally rebuilt in its current style from 1390-1410 including the addition of the City Watchtower (Stadttor) on the Eastern side (no longer exists). Saint John’s was forced to switch to Protestant during the Reformation, but and since changed back and is now Rothenburg’s only Catholic church. The interior is one of the blander in town, but it is still an important place to take note of. About Medieval Crime Museum: Sitting in the former monastery complex of the Monks of Saint John is the only law museum in Europe! The Medieval Crime Museum covers over 1000 years of Medieval law history, sensational criminal cases, including the persecution of witches and witchcraft in Bavaria. Our favorite items are the instruments used for torture, shaming, and punishment. The devices were used for everything from stealing, people who cheated on their spouses and even those who gossiped too much. It is by far one of the coolest things to do in Rothenburg and helps get you into the Medieval spirit. About Zur Höll: Playing off the nickname, our favorite restaurant in Rothenburg is To Hell Tavern (Zur Höll). The restaurant sits in the oldest home in Rothenburg with a foundation dating back to 970. While small, the tavern has an authentic Medieval feel and the widest selection of Franconian wines in town. We love the fact the the restaurant is only open for dinner as it really helps you to expierence the true Rothenburg after the hoards of day time tour bus tourists are long gone. Zur Höll Hours: Daily 5-11pm. Restaurant Website: (HERE). About Castle Road: As you hit Castle Road you get your first view of the Tauber River Valley over the city wall. While we will be turning right to see the royal castle ruins beyond the Barn Gate, we will also visit the other end of Castle Road at the end of this free Rothenburg walking tour. A large part of Castle Road in Rothenburg was part of the Saint John’s Monastery in the Middle Ages, which was established in 1200. Since the monks wanted to be separated from the general public to avoid temptation, a large part of the alley was covered with a wooden roof and was closed to non-monks. The roof made the alley very dark, so it gained the nickname Hell Alley. From Rothenburg, Castle Road was actually part of 1200km trade route connecting over 70 castles that helped the early city prosper. In the East, the route extended through Nuremberg and Bamberg all the way to Prague. In the West, it went through Schwäbisch Hall and Heidelberg and its way to the French border in Alsace. Known as the Thuringian Castle Road, it was the middle route of the Saint James Way to France and brought an influx of pilgrims who called Rothenburg the Franconian Jerusalem. About King Conrad’s Castle: The appendix-like park on the West side of Old Town Rothenburg was where Conrad III, King of Germany (House Hohenstaufen) built his royal castle in 1142. This castle led to the development of the surrounding town by 1170 and gave it the name Rothenburg ob der Tauber, meaning Red Castle over the River Tauber. As you walk through the Fürbringer Barn Gate (Burgtor), you enter what was formerly the walled farmyard (wirtschaftshof) which then connected to the fort-like castle by a bridge (see image). Conrad chose the location because the fertile land was cheaper than administrative centers like Bamberg or Würzburg, and also because he had close ties to the area. In 1115, Conard III (House Hohenstaufen) married Gertrude, the daughter of Count Heinrich II von Comburg-Rothenburg who founded Berchtesgaden in 1102. The Counts of Comburg (died out in 1116) oversaw parts of Franconia at the time from their court in Schwäbisch Hall and built the small fort known as the Vinegar Jug Castle (now gone) on the hill of Rothenburg’s Infirmary Quarter in 1080. Conrad also came from a powerhouse family as his dad was the Duke of Swabia (followed by his brother), his mom’s dad was Holy Roman Emperor Henry IV, his mom’s second husband was Margrave of Austria Leopold the Good (House Babenberg) who developed Kerms & Vienna, and his maternal uncle was Holy Roman Emperor Henry IV. Through his bloodlines, Conrad was directly related to all previous 18 Holy Roman Emperors going back to Charlemagne the Great and was destined for the throne himself. Just one year after the wedding Conrad III was named Duke of Franconia by uncle Emperor Henry IV. Conrad was also named Prince-Regent for Germany along with his older brother Frederick I (Duke of Swabia). HERE is a map of the territories at the time to understand how much land the brothers were put in charge of. When Conrad’s uncle Henry IV died in 1125, his brother lost the appointment for King of Germany in surprise fashion to a distant cousin Lothair III (Duke of Saxony, House Welf) who leveraged Papal support. This was the start of the feud between the Guelphs (House Welf) versus Ghibellines (House Hohenstaufen) which would later spread in Tuscany and last over 100 years. After huge military defeats and the election of Lothair as Holy Roman Emperor in 1133, the brothers eventually had to acknowledge as their ruler. Gertrude of Comburg had died in 1131 after giving Conrad three daughters so he re-married to Gertrude of Sulzbach in 1136, whose dad Count Berengar II founded Berchtesgaden in 1102. Conrad’s brother-in-laws through the Berengar sisters gave him powerful allies including Prince Vladislav II of Bohemia (later King), Prince of Polish Ladislaus the Exile, and Byzantine Emperor Manuel I. With his bloodlines and new alliances, Conrad III was quickly elected King of Germany in Coblenz (March 1138) after Lothair died (December 1137), snubbing Lothair’s son-in-law and heir, Henry The Proud (Duke of Bavaria & Saxony, House Welf). Because Henry the Proud didn’t support him, Conrad striped Henry of the Bavarian duchy and gave it to his half-brother Leopold Leopold the Generous (House Babenberg) who also control the Margrave of Austria. The newly crowned King Conrad III grew to be one of the most powerful men in Europe over the next 14 years and seemed destined for the Holy Roman Empire Crown which had sat vacant since Lothair’s death. Before leaving in 1147 with 20,000 troops to fight with Louis VII of France in the 2nd Crusade, Conrad III arranged for his sons Henry Berengar (then 10 years old) and Fredrick IV (then 2) to be named Co-Kings of Germany (Prince Regent) with him in Regensburg to take over in case he died in battle. He participated in the ill-fated Siege of Damascus (1148) and returned to Germany. Henry Berengar, who was once betrothed to the Princess of Hungary, was the winning general at the Battle of Flochberg (1150), but died later that year. Soon after, Conrad III died on the 15th of February 1152 at Bamberg (buried at Bamberg Cathedral) of malaria. The title King of Germany then went to Conrad’s nephew Frederick Barbarossa (Emperor 1155-1190) who had fought with him in the 1st Crusade instead of his own six-year-old son Frederick IV (1145–1167). It was a bit controversial as only Frederick Barbarossa and the prince-bishop of Bamberg was at his deathbed to hear the order. Frederick IV was given his dad’s castle in Rothenburg and named the Duke of Swabia, but the Duke of Franconia title went to the Bishop of Würzburg. Frederick IV took part in his cousin’s campaigns in Italy where he died from disease after occupying Rome in 1167 at the age of 21 and with no heirs. Emperor Barbarossa’s heirs produced three more Holy Roman Emperors and several Kings of Germany before the Hohenstaufen line died out in 1254. Because it sat on the crossroads of two major trade routes, Rothenburg then gained Free Imperial City statue in 1274 by Rudolf I King of Germany (Habsburg Dynasty). After Duke Frederick IV’s death in 1167, his dad’s castle was only lightly used. The last Hohenstaufen King of Germany (Conrad IV) only stayed at Rothenburg Castle seven times between 1238 and 1251, then it sat mostly vacant as Imperial Property, and was eventually ruined by an earthquake in 1356. 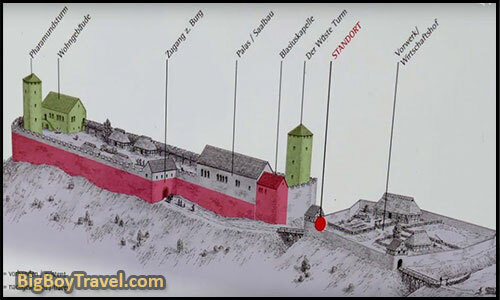 About Burggarten: In 1356, Castle Hohenstaufen was ruined by a large earthquake (known as the Basel Quake) which also damaged sections of the old city wall. In 1380, the Emperor sold the ruined castle to the city and allowed much of the stone to be quarried to repair and bolster a growing Rothenburg’s fortifications. Quality stone was a precious commodity at the time and the 820 feet (250 meters) long and 130 feet (40 meters) wide fortress had a lot of it. In 1400, Mayor Toppler decided to rebuild the former castle’s Upper Ducal House into what is now the Chapel of Saint Blaise. As this royal castle didn’t have a chapel, the original Ducal House was connected to King Conrad’s private quarters and where he received guests during his visits. At the time of Toppler’s work, Rothenburg was the 2nd largest city in Germany at 6,000 residents and one of the 10 largest in the Holy Roman Empire. Against the North side of the Ducal House, look for the stone Jewish Memorial from the Rintfleisch Massacre of 1298. At the time Rothenburg’s Jewish community lived along the outside of the original city wall, but had to seek refuge in the Hohenstaufen Castle for three days when a traveling mob arrived to kill them in a religious persecution. With the help of local Christians, the mob burned and killed a majority of Rothenburg’s 500 Jewish residents including women and children. Before being stopped, the mob had ravished 146 communities in Franconia killing over 20,000 Jews. While parts of the old Jewish Quarter remain near the White Tower, the community was officially banned from Rothenburg in 1520. In more recent time, a second memorial was added inside the chapel for German soldiers who died in WW1 & WW2. Roaming further down the former castle grounds, you’ll run into the orange Garden House (Gartenhaus) cottage which was once the main entrance into Hohenstaufen Castle. The cottage was built over the foundations of the ancient gatehouse in the 1600s and still incorporates the old Romanesque archway into its Eastern facing facade. Although not castles in the 1100s didn’t have pleasure gardens, the Westwise of the cottage has a lovely Baroque Castle Garden (Burggarten) in what was the once the fortress’ main courtyard. The garden has beautiful geometric flower beds with 8 sandstone statues representing the 4 seasons and 4 elements. We love taking photos of the statues framed up with vines hanging from the wooden trellis tunnel. The garden is one of the best places in Rotheburg to relax, offering great views of the Infirmary Quarter skyline and the Tauber River Valley below. As you reach the Western end of the former castle grounds you will even get to look down at Mayor Toppler’s unique top-heavy home along the river. This end of the castle had a watchtower and three story manor house. A memorial stone was added in the Castle Park in 1908 honoring the 500 year anniversary of the death of the famous Mayor. About The Castle Gate: While the Fürbringer Barn Gate was the original entrance into the castle grounds, traffic shifted to Castle Gate (Burgturm) which connected to the grounds to the Market Square. After Castle Hohenstaufen was destroyed in the earthquake of 1356, they needed to enhance their defense on the West side of town. They decided to super-size the Castle Gate (completed in 1460), adding the town’s tallest watchtower, a drawbridge, and other protective measures. Two small gatehouses were built in front of the Castle Gate to help funnel in traffic and thwart would-be attackers. Just inside the gatehouses, you’ll see a decorative mask which has a mouth hole the guards would use to pour hot tar on attackers. On the sides of the mask, you’ll see two large slots where chains were fastened to raise the gate’s drawbridge. In Medieval times, all of the city gates were locked at sundown so you would have to pay a fine at the gatehouse to get in after dark. You would also have to enter a special Eye-of-the-Needle door with a small opening only big enough for one person at a time, known as the manhole. The current wooden manhole door dates back to 1555. About The Western Towers: The area just outside the Western edge of Rothenburg’s city wall is an excellent tourist-free place to explore. There are 4 different towers and a series of stately mansions built right into the fortification on this stretch of the Rothenburg city wall walking tour. The views of the Tauber Valley and Toppler’s Water Palace below you are also very nice from this area. Our favorite of these towers is square-shaped Gravedigger’s Tower (Totengräbersturm) which nicknamed after the gravedigger Beadie who lived here and in the neighboring cottage at the turn of the 14th century. It may be the most boring looking of the four Western towers but there is something about it being the gravediggers home that makes it interesting. In Medieval times the town Executioner and the Gravedigger were looked down on as lower members of society. Because the public was also superstitious, members of these professions weren’t allowed to live with the general population and had to live in their respective towers. The prettiest of the towers in this section is right as you leave the Castle Garden called the Burgeck. Not only is this fairytale tower attached to a theater, it is also next to the famous Escape House. During the Peasants Revolt in 1525, one of the people set to be executed was a doctor who escaped out the window and down the wall. Further along the wall, you will find the round Convent Tower (Klosterturm) which was built in 1408. Not only does this tower have direct access back into town through the wall, but it sits right next to a popular playground for childer. As you reach the Northwestern corner of the City Wall you come the Punishment Tower (Strafturm) which was used to jail and punish people with light criminal offenses. It’s too bad that this tower from 1410 was used for punishment as it is the most romantic looking on the Western part of the wall. As the Northern edge of the wall curves around town you also get to walk through an excellent section of Rothenburg’s old Medieval moat. About Saint Wolfgang Church: When tourist make it all the way to the Saint Wolfgang Church they usually climb up on the city wall below the 99-foot-tall Narrow Gorge Tower (Kilengentor) and complete miss seeing the church. The fortified church was incorporated right into the city wall and has an exhibit about sheep and wool trade. Saint Wolfgang Church also helps to put on the annual Shepherds’ Dance (Schäfertanz) that pays homage to Rothenburg’s days as a wool trading center and when the local Shepards’ Guild gained rights to a public feast in 1517. The coolest thing at the church is a rare chance to actually go inside Rothenburg’s city wall and descend down into the fortifications in the basement. It is definitely a different perspective than you get walking on top of the wall. About Narrow Gorge Tower: Drops steeply to the Tauber River which is why it has the name Narrow Gorge Tower which was built in the 1200s. Around the year 1500, the gate tower was raised to a 99-foot-tall watchtower which also served as a large water tower with a lantern hood top. Access for climbing up the Narrow Gorge Tower was directly from the attached church in Medieval times. Neighboring steps provide access onto the wall today. About The Northern Wall: The stretch of Rothenburg’s city wall from the Narrow Gorge Tower all the way to the Hangman’s Tower is the least crowded section to walk on even on busy tourist days. As you pass the old Gun Powder Tower and look out onto the red rooftops of town it can be very peaceful. The scenery here isn’t as grand as the other sections of wall, but because you can often have it to yourself it really helps you enjoy the experience of walking along the wall itself. Remember that it was this Northern part of Rothenburg that was badly damaged by bombings in WW2 requiring most of the area to be rebuilt. You will pass by open lots and parking areas which makes you appreciate that the core of town was mainly left untouched during the war. About The Gallows Tower: The Gallows Tower was built in 1388 in the largest expansion of the city wall but was burnt by fire in 1400. The tower was quickly repaired and sits at the highest point of the town fortification. There are square artillery posts along this wall section which once were as many as 12 as this was the weakest part of the city wall. To strengthen this Northern section of the wall they added 5 watchtowers in 1600, but General Tilly breached the wall at the neighboring Kummereck Tower in 1631 and the French did the same thing in 1645. The city gallows stood outside the Gallows Tower in the Little-Head Meadow (Kleine Kopfwiese) and were used until the mid-1800s. This is also a great place to see the dry moat that rings the village. The dry moat between this tower and the Woodsman Tower & Gate (Röderturm) is where the Knights of 1274 tented camp is set up during Rothenburg’s Imperial City Days Festival every September. About The White Tower: The White Tower was built as part of the original city wall in the 1100s and is the oldest surviving along with Marks Tower. Next to the tower was the Jewish Community Center (used from 1390 to 1520) and you can see memorial Jewish grave markers below the tower. The original headstones from these graves are on display inside the Imperial City Museum. Jewish Lane (Judengasse) branches out from the tower and is considered the only surviving late-Medieval Jewish street in Europe. The road formed when the Jews were banished outside of the city walls in 1298 ringing the city wall. This is the same year that 500 members of the community were burned alive inside Rothenburg’s vacant castle by a traveling mob. The community faced further hardships when they were completely expelled from Rothenburg in 1521. The Seal Fountain (Seelbrunnen) in the Jewish Quarter is capped by Minerva, the Roman Goddess of Wisdom built around 1600. She is holding the seal of Rothenburg as she is the patron of the city and a mirror because she is said to be able to look inside your soul. About Old Town Rothenburg: The tightly packed city center of Old Town Rothenburg is filled with Medieval lanes, half-timber houses, amazing shopping, and grand buildings you just have to see. Read More: Old Town Rothenburg Walking Tour. About Mayor Toppler’s House: Little moated palace was built in 1388 by legendary mayor Heinrich Toppler. Has an awesome tower. Is open to the public. Built partly as a defensive tower, partly as a residence in 1388, this moated castle once belonged to the powerful Lord Mayor Heinrich Toppler. Now it is filled with furniture from the 16th to the 19th century.